This summer my wife, Sandy, and I took a trip to Alaska to see the countryside and ride some trains. The trip was well worth the time and expense. 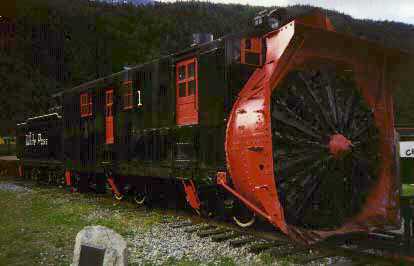 Alaska and the Yukon have spectacular scenery and a fascinating history besides some interesting railroads. Our trip started by air from Seattle to Juneau, then by day boat up the Lynn Canal (really a fjord) to the old boomtown of Skagway. We traveled by the White Pass and Yukon Route narrow gauge railway up through White Pass and then by motor coach through White Horse and up the Alcan Highway through the Yukon and Alaska to Fairbanks. There we boarded the Alaska Railroad for a trip south to Denali. We were supposed to ride the Alaska Railroad further south to Anchorage, but a gravel train wreck had torn up 1000' or so of track on the morning of our departure from Denali so we were bussed to Anchorage. Later in the day, a coal train wrecked too. We traveled by bus from Anchorage to Seward where we met our cruise ship, the MS Statendam and then we sailed down the inside passage for a week making several stops along the way and ended up in Vancouver after 16 days of travel. Since this is a railroad related page, I'm only posting some of the best pictures that I took along the way. I've tried to keep the pictures small so that they won't take overly long to load. 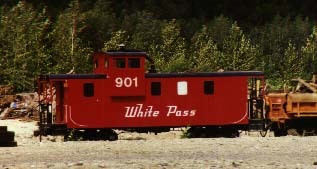 The narrow gauge WP&YR began operation from Skagway to White Horse in 1900. This railroad was built in response to the Yukon gold rush of 1898 that opened up the Yukon. During the winter of 1898, thousands of gold seekers carted tons of supplies over White Pass and the nearby Chilkroot trail and then followed the Yukon river by boat to Dawson, the site of the strike. So much material was moved by manual labor that an English investment group funded a railroad. The railroad ran, sometimes profitably, until 1982 when world metal prices dropped so much that all the mines shut down and the railroad was left with virtually no traffic to haul. The railroad shut down too. 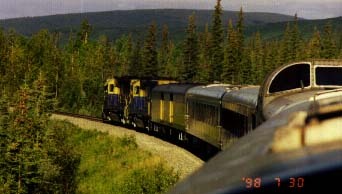 However, in 1988, the railway started excursion service as cruise ships began to ply Alaskan waters. Now, the railroad makes more money than it ever did as a freight hauler. As many as 9 trains a day, crammed full of tourists, will run during the entire tourist season. Now the line goes only about 30 miles to Bennett instead of the 70 miles or so to White Horse but it does a booming business. The track to White Horse is still in place and appears to be in fair shape. Skagway Alaska is a very small town built on a flat spot at the end of a fjord called the Lynn Canal. 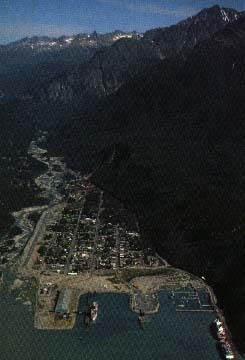 Skagway is the base of operation for the White Pass and Yukon Route. You can see the WHOLE town in this photo. There are about 1500 full time residents which swells to about 3000 with temporary residents for the 4 month tourist season. As many as six cruise ships may dock at once further swelling the town by maybe another 6000 to 10,000 people. Skagway survives on the money laden tourists that these ships bring in daily. During the winter, the weather is miserable. It can get very cold and the wind will often blow at gale force down the valley for a week at a time. The WP&YR has one operational steamer, a Mikado. They run this engine on alternate Saturday's. I didn't know that there was a steamer there until Saturday afternoon when I heard a steam whistle and I sat bolt upright in my hotel room. I didn't manage to get a picture until the next day when the engine was sitting in the engine service yard. Most of the WP&YR trains are pulled by a set of three C-C GE built diesels. I haven't been able to find much information about these units, but the railroad has a lot of them. I saw three operating sets waiting to leave the station in the morning. The railroad also uses some MLW built, Alco designed C-C diesels. These are the units that are the prototype for the LGB model. I saw only this set of three of this type. Sitting outside the engine yard, hooked to a short string of gravel hoppers, I found this comfort cab version of the MLW diesels. This very clean caboose was hooked to the end of the string of gravel hoppers. I would guess that this is their work train. On prominent display is plow #1. This plow is nearly 100 years old and it still works. It has been used in recent years to clear the line in preparation for the onslaught of tourists. 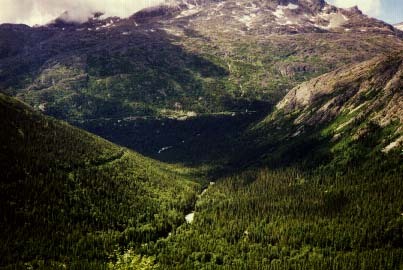 The WP&YR works its way up the east side of the glacier carved valley and over White Pass. 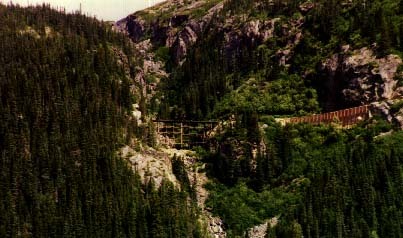 For many years, the railroad was the only way over the pass except on foot. Recently a highway has been opened on the west side of the valley to allow road access inland. In two places, the railroad runs up side valleys to follow the terrain and gain elevation on a nearly constant 4% grade. This view is looking up at the track that we will soon traverse. At the end of this side valley, this view looking back shows the railroad right of way as a line cut in the forest at the left. Up near White Pass a new steel bridge was built to bypass an original timber and steel structure that is currently rotting away. The end of the line for us was a place called Fraiser, which is nothing more than a Canadian Customs station. 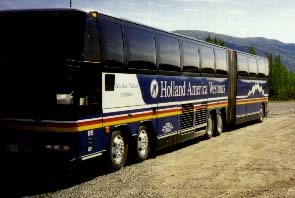 There we boarded this monster, 60', 60,000 lb articulated motor coach for a 2 1/2 day trip through the Yukon and Alaska, but that's another story. In 1914, the US Congress approved funding to build a federally owned railway to open the interior of Alaska to exploit its mineral and timber wealth. The line originates in the port of Seward and travels through Anchorage to Fairbanks. In 1982, the line was transferred to the state of Alaska. The line is standard gauge and still hauls both passengers and a considerable amount of timber, freight and coal. There is a large coal mine along the route and coal is hauled north to Fairbanks to be burned for power and heat. Coal is also hauled south to Anchorage for the same reason and much of it goes all the way to Seward to be loaded on ships bound for Korea. The coal is very low in sulfur. However, a significant commodity during the summer months is passengers. The line moves 2,000 passenger every day in the corridor between Fairbanks, Denali and Anchorage. Most of these people are tourists. The trains usually consist of several Alaska railroad owned cars, and about eight private cars. On our train there were 5 Holland America Westours full dome cars and 3 more Princess cars. There were only 30 full length dome cars ever built, 14 by Budd and the balance by Pullman in the early 50's. 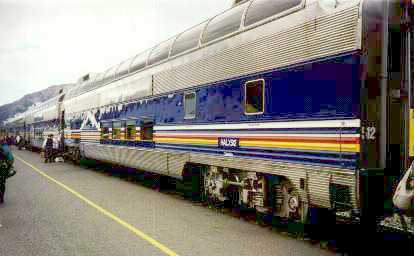 Many were used by ATSF on various Chief's until the Amtrak era. These cars were not transferred to Amtrak due to a disagreement concerning their value. The cars went through several owners until 13 mostly Budd cars were collected by Holland America and refurbished at a cost of $500,000 to $1,000,000 each. They seat typically 52 passengers on the upper level with 24 seats in a lounge in the lower level. This is a view from the front of the first full dome car in the train. 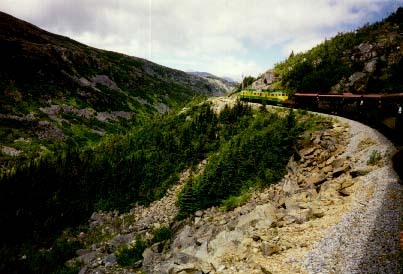 Most of the scenery in the northern part of the Alaska railroad is spruce forest and muskeg, a uniquely Alaskan marsh. I've shot photos of at least two dozen different Alaska Railroad locos, and after studying the photos, it seems that EVERY one of them is a GP-35. 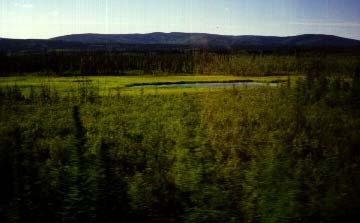 This is view from the train of a typical central Alaskan muskeg area. Muskeg is a marsh area that is almost totally composed of decaying plant matter. It is so soft that a person will sink right in. Building roads and railroads on muskeg is a real problem. Permafrost is also a serious problem. This whole area of Alaska is composed of discontinuous permafrost. Some areas are permafrost and some areas are not. Building on permafrost will usually result in severe settling. After running south from Fairbanks to Denali, the line starts climbing the side of the Nenana River valley. 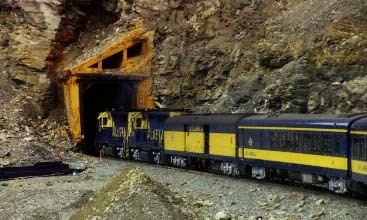 This is the only tunnel on the line. 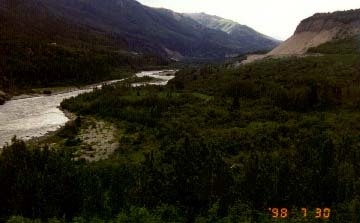 The Nenana river flows in a glacier carved valley northward from Denali. This river is used for rafting and has Class 3 rapids. This scene is typical of the view from the train as it enters Denali. On the cruise ship dock at Seward, I snapped a picture of this AR boxcar with a strange truck. I've never seen one like this before. Bill Sharpe saw this picture and wrote: They're called allied full cushion. In 1943 the Defense Department contracted with Pullman for 1,200 troop sleepers. 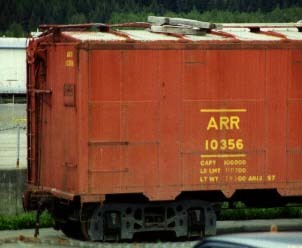 Based on a standard box car design. They contained three tiers of bunks and were designed with postwar conversion to boxcars and express boxcars in mind. After the war they were sold and ended up on many railroads. By 1956 these allied full cushion trucks were bared from interchange service. Since the AR does not connect with any other railroad, these trucks could still remain in use as they couldn't find their way into interchange service. 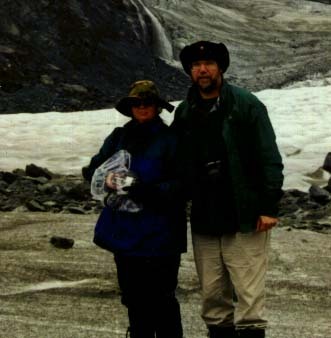 This is myself and my wife, Sandy, standing on the Mendenhall Glacier near Juneau. We got there in a helicopter. The second week of the trip was spent on the MS Statendam, a very nice ship. The ship is 55,000 gross tons and 720 feet long and would do 25 knots if they put the pedal to the metal. The ship is stabilized and handled rough seas (we had gale force winds and 16 foot swells one night) very well.